Keen golfers spent nearly $2000 on their equipment. And altogether, as a nation, we spend a combined total of $500 million on golf balls each year! Besides the golf balls, a fair proportion of that $2000 will go towards the cost of new golfing apparel. When you’re talking about that kind of money, it’s important you’re on-trend and up to date with the latest technology. But where do the trends you see today come from? Here are 7 golfing apparel trends – some which have shaped the industry’s appearance in the past, and some which are still influencing golf today. Caps are a common sight on the golf course – from the more traditional flat cap style to the modern peaked variety favored by professional golfers. These days, it can cost hundreds of thousands of dollars for a sponsor to get their logo onto a pro golfers’ gear. But the trend for sponsoring caps was actually kick-started by appliance manufacturer Amana, who offered just $50 each to PGA Tour participants willing to wear their logo. These days, you can find all kinds of innovative hats which promise to keep the sun out of your eyes while still keeping your head cool, often by using mesh panels for ventilation. 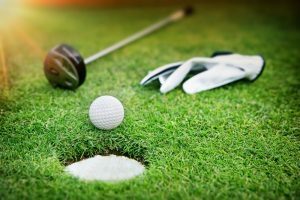 Golf gained massive popularity in the 1920s, as more people began to see it as a sport for the middle classes – it had previously been viewed as something reserved for upper-class aristocrats. While the famous ‘plus fours’ trouser style emerged around this time, these were actually a development of the ‘knickers’ which were commonly worn on the course before the 1920s. Knickers were derived from the knee breeches of English court dress – short trousers which extended to or just below the knee. You can still find them on sale in places, but the world has definitely moved on. Clubhouses might keep some formal rules, but clothing definitely feels more relaxed out on the green. Golfing trousers available now tend to be stretchy and lightweight, helping players to turn easily and follow through on their drives. That said, tweed plus fours haven’t gone completely out of fashion, and luxurious all-wool designs can actually be extremely comfortable, and perhaps preferable in cold weather to their lightweight cousins. During the 1920s, most footwear found on golf courses was rather formal. The style of shoe wouldn’t have been out of place in an upmarket office but was equipped with cleats for the outdoors. These days, most players will have moved on to more informal shoes – a hybrid of sneakers and studded athletic shoes. However, you can still find some more formal styles on the market if you look hard enough. Modern shoes are quite indistinguishable from other types of sneakers most of the time. Waterproof shoes are easy to find on the market, and we know anyone who has been caught in the rain during a round will enjoy not having a soggy pair of feet afterward. Back in the 1500s, players would simply carry their clubs – and might have tied them together with twine or cord to help carry many at once. Thankfully, we don’t have to do that now – these days a serious golfer needs a serious golf bag. Golf bags grew in size over time as more specialized clubs were developed, but this was eventually limited by the USGA. Its rules state that a maximum number of fourteen clubs can be carried and used by a player during a round, and there are restrictions in place to prevent players borrowing clubs from someone else inappropriately. Because of this rule, golf bags are now of a fairly standard size – though many have extra features. Waterproof zippers are commonplace these days, whereas, in the early days of the sport, a pull string top may have been all that was available. Valuable pockets are one basic feature we particularly like. Anyone who has accidentally dropped their driver on something precious will too! Polo shirts sit somewhere in the middle of the formal-informal spectrum. They are extremely popular among golfers as the short sleeves and flexible material allows for less restriction in a player’s swing. Manufacturers go to all kinds of lengths to make their shirts better than the competition. We’re talking micro-fiber cooling, low-friction, sweat-wicking shirts that promise to enhance your time on the course. Who knew that a shirt could be so important to your game? It’s not just polo shirts that get special treatment from clothing manufacturers. Dunning (owned by Ralph Dunning) is one company that invests heavily in research and development to improve golf clothes. The company doesn’t bulk buy fabrics from other producers. Instead, it engineers its own fabrics in-house, using natural fibers that it believes can offer a real advantage to players. It aims to strike a balance between comfort and high performance. It’s far from the only company undertaking such activity. Puma is so confident of how far ahead of the competition its new series of pants are, it has even put ‘tech’ in the name. We love a good gadget, and they’re fast becoming a valuable asset to add on to your golfing apparel. GPS watches are more popular than ever. A quick glance at your wrist can give you valuable information on how far you are from the green, while also allowing you to skim through your emails between shots. Some watches can even capture data about the speed and tempo of your swings, which helps you to improve your swinging style. Alternatively, there are now clubs on the market which do the same job of tracking speed and can also report back to you on how far your shot has made it from the tee. We’ve got all the latest information in our gadget reviews – and we also review all other types of golfing gear. See how you could improve your golf game with an equipment upgrade! The Best Winter Golf Gloves for Cold Weather The Best Cold Weather Golf Gear What are the Best Golf Shorts? Is this The Best New Golf Hat Ever? ‹ Is this The Best New Golf Hat Ever?